Suspenseful, exciting and fast-paced, James Murray, star of the ‘Impractical Jokers‘ delivers big with his first novel, ‘Awakened‘ co-written with sci-fi author Darren Wearmouth. 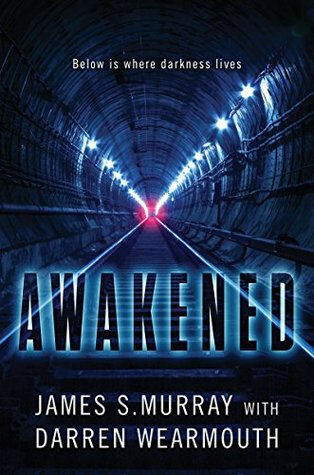 ‘Awakened’ takes place underground in New York City during the opening of the long awaited Z Train subway line after a decade in the making. With an elite audience including the President of the United States, the mayor of New York stands with great pride and joy as they await for the inaugural subway train to arrive. Fesitve spirits quickly change as a bloodridden subway rolls in empty. No one can begin to imagine the terror that lies ahead. ‘Awakened‘ is full of twists that keeps the reader engaged. With each turn of the page, the story is more intensified with many unforeseen circumstances. The characters are well developed and the descriptive plot makes you feel as you are in the bone chilling subway tunnels yourself. ‘Awakened’ does not disappoint. Just brace yourself for the blood, gore and nightmares that await!